I'm kind of obsessed with everything rhubarb right now, so when I pulled a package of blackberries out of my freezer, I went looking for a recipe that called for both blackberries and rhubarb. 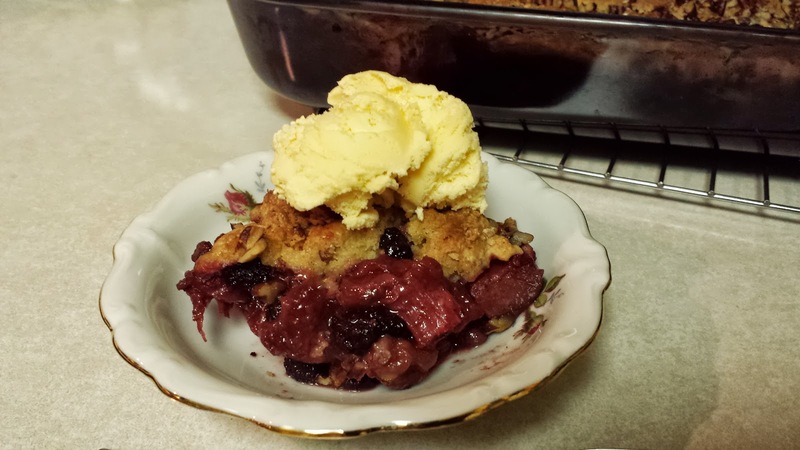 I found recipes for Rhubarb and Blackberry Snack Cake, Rhubarb and Blackberry Crumble Bars, and this Blackberry Rhubarb Crumble. 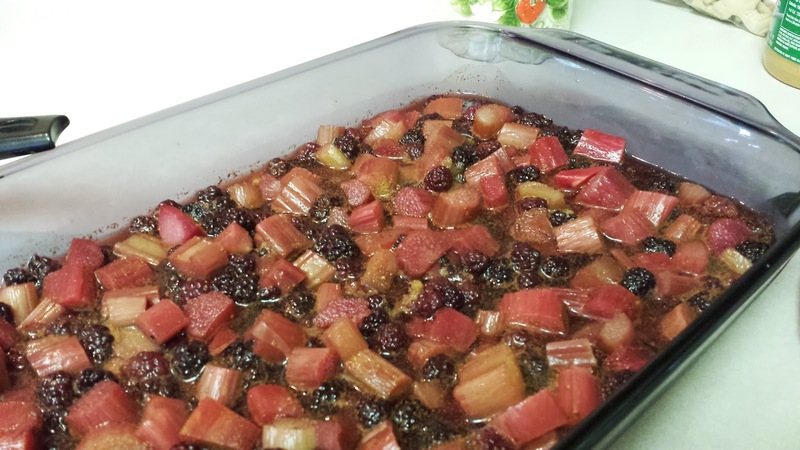 Place the blackberries and rhubarb in a 9x13-inch baking dish. Sprinkle with the 1/2 cup brown sugar, cinnamon, ginger, and salt; toss gently. In a medium bowl, beat the eggs. Mix in the vanilla and 3/4 cup brown sugar. Mix the flour with the baking powder and salt and stir into egg mixture to make a clumpy dough. 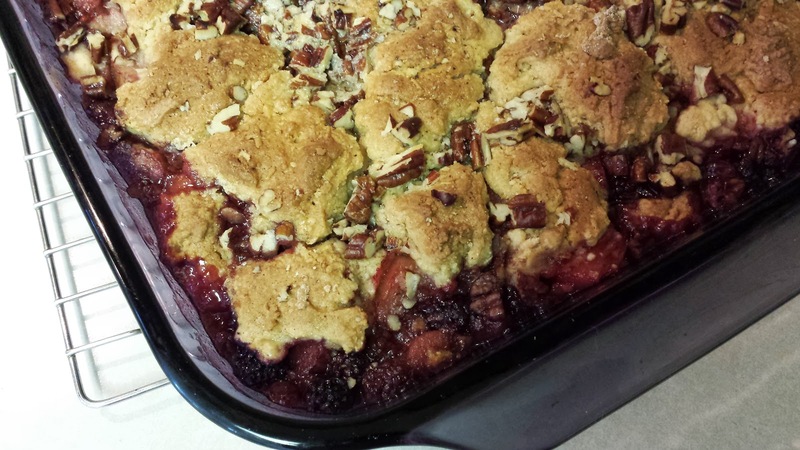 Using your hands, drop clumps of dough evenly over the fruit. Have some extra flour handy to clean off your hands and clean out the bowl, spreading 'crumbles' over the top of the clumps. Sprinkle the chopped pecans over the top, then pour the melted butter over everything. Bake for 35 minutes at 375°F, or until the top is golden brown and the crumble is baked through. Let sit for at least 30 minutes before eating. The original recipe called for a bit more (fresh) fruit, but I used what I had - frozen. One of the comments said that rhubarb and blackberries are not in season at the same time, making it hard to have both at the same time. Using frozen works very well and solves that problem. It does not even need to be completely thawed. no need to dirty another bowl. What surprised me - never putting rhubarb and blackberries together before - is that the blackberry flavor really comes through, even though there is twice as much rhubarb. 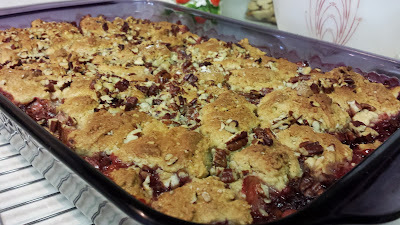 I did not cut the sugar down in this recipe as I normally do because Faith, who posted the original recipe said the fruit was "proudly tangy and not too sweet" and that rhubarb should not be covered up with sugar - which I completely agree with, of course. So I took her at her word, and I think it was just right. I especially love the topping on this. I'm pretty sure it's the brown sugar. I'm going to have to try it with different fruits, too.